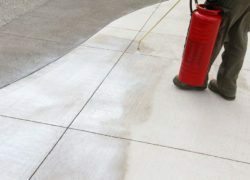 DECK-O-GRIP W/B is a non-yellowing, water-based, blended, polymer-based, high solids, liquid sealer for decorative concrete. The product is clear, transparent and easy to apply. DECK-O-GRIP W/B also offers greatly improved chemical resistance when compared to standard acrylic-only based curing and sealing compounds. **Low concrete or air temperatures and/or high relative humidity will extend drying times.